The Amish French Country Farm Table has elegant features that will bring to mind the Provence countryside. This farm table features two handy draw leaves at the ends of the table that easily pull out and lift up and then when not in use easily store away underneath the table. You can choose to order 12" or 18" draw extensions. 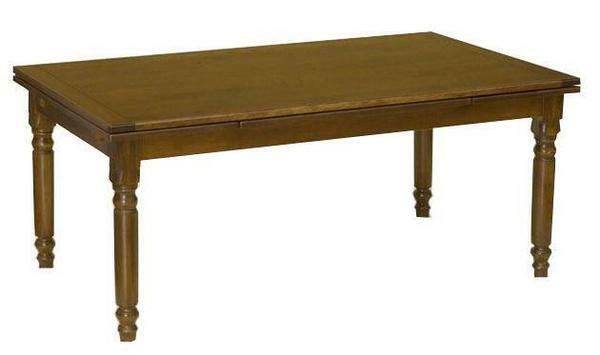 This Amish Provence French Country Extendable Wood Dining Table is available in a variety of hardwood options such as cherry, hard maple and elm wood. Call today to receive wood finish options to help you match this farm table to existing furniture in your home. Feel free to call DutchCrafters with any questions at 1-866-272-6773. Also check out the pictured Hartford French Country Dining Chairs!